Experience the rockin relief of body compression with our amazing light brown arm compression sleeves. Your arms will adore these soft, comfortable for everyday use arm sleeves which are made of 87% nylon and 13% spandex. 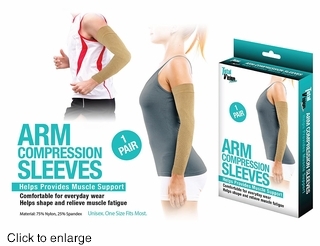 Stretchy yet supple these unisex, one size fits most sleeves do a great job of helping to relive muscle fatigue and manage your body shape. Each box contains two sleeves.